Photo: wet and wild (1967), Photograph by Arthur Evans, courtesy of the Tang Museum at Skidmore College. 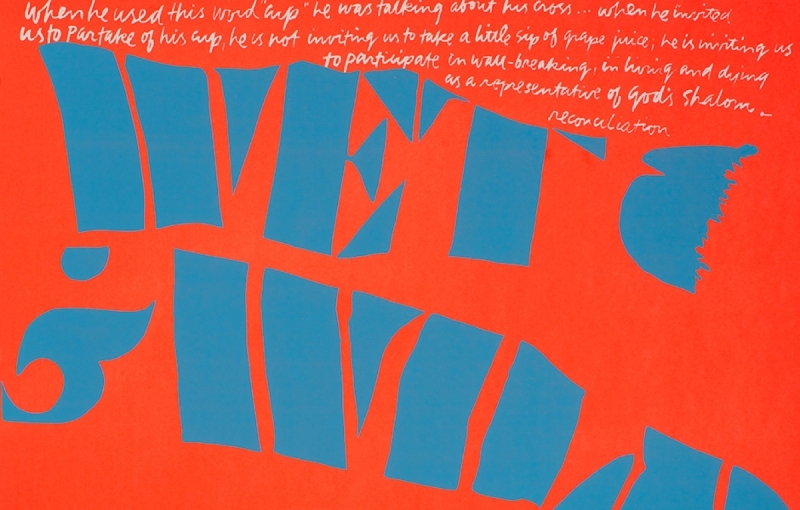 Someday is Now: The Art of Corita Kent, on view at the Pasadena Museum of California Art throughNovember 1, presents is the first full-scale of the designer’s impassioned and revolutionary work. Kent’s screen prints and posters seem all to relevant today — she combined faith, activism, and teaching to spread acceptance and hope in the face of the glitz and glam of Hollywood and advertising. Curator Michael Duncan sheds light on the spirit of Corita Kent’s work. What does Kent’s work say about Los Angeles and her time here? Corita’s great 1960s Pop work fed off the billboards and signage of L.A. streets. By twisting and transforming advertising slogans and logos, she made pop culture a vehicle for upbeat humanism. The exhibition also tells an important story about radical Catholicism in Los Angeles during the 1960s. The desire of Sister Corita’s order the Immaculate Heart of Mary, was to better serve their community, but their mission was stifled by the conservative Cardinal McIntyre and the order ended up leaving the official structure of the Catholic church. Corita’s own spiritual enlightenment and struggle with organized religion seems emblematic of the culture at large. This exhibition of Kent’s work couldn’t come at a better time in our history; is there something we can glean from her work that seems especially relevant to what we can see and earn about the socio-political issues of today? Americans are still blindsided by the hype of Hollywood and advertising. The web has only accelerated the ubiquity of advertising. Corita’s rewriting of advertising’s messages is still completely relevant. In particular, her gutsy and moving works about race could have been made this week. Plus her sense of poetry and word play is desperately needed in our increasingly literal and tone-deaf culture. She had ties to people like Bucky Fuller and Charles and Ray Eames, but did the architecture and design of the time influence her work? The sense of play and iconoclastic invention in Ray and Charles Eames’ work was a major inspiration. Her formal experimentation shows her to be a high modernist — but one with a streak of anarchism.